I received this book for free through Bostick Communications. The author sent me this book in exchange for an honest review. Previously, I have reviewed another book, A Veil Of Blood Hangs Over Africa, by Lucia Mann and I thoroughly enjoyed that book so I had high hopes for this book and I was sure that this book would also be an amazing read. Synopsis: A witch doctor's power and his ancient tribal ways cruelly collide with the force and authority of modern Africa. While the tale of South Africa in the wake of world war II is riveting, violent and cruel, it also is brimming with stories of kindness, compassion and courage. 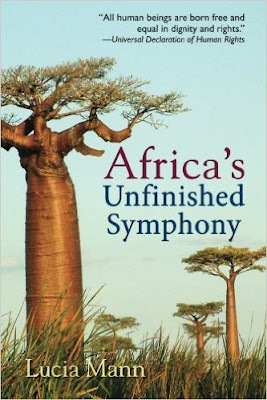 Africa's unfinished symphony highlights commanding characters who not only bring haunting racial clashes to life but also convey the intense conflicts that existed between archaic customs and modern influences. You will be captivated as you follow the convoluted path of Farida of the ancients battling to become Bertha of the modern world. But are the outcomes of her struggles the best results for her and her beloved Africa? This book will immerse you in historic African themes that will jolt you out of complacency and into compassion. Review: I would like to thank the author for the chance to read another of her amazing books. This is the second book that I have read by Lucia Mann and it has lived up to the expectations that I had about how much I would love this book based on the first book I read. I am positive that this book will be in my collection for many years to come and that I will settle down in front of the TV with this book many more times in the future. I plan to buy all the rest of Lucia Mann's books.